1,953 km of cycling - as part of a bicycle world trip - from the border with Botswana westwards across Kalahari Desert to the capital Windhoek and to the Atlantic Coast to Swakopmund and Walvis Bay, across Namib Desert to Sesriem and Sossusvlei Dunes and southwards through the desert to Fish River Canyon and to boundary Orange River at the South African border. 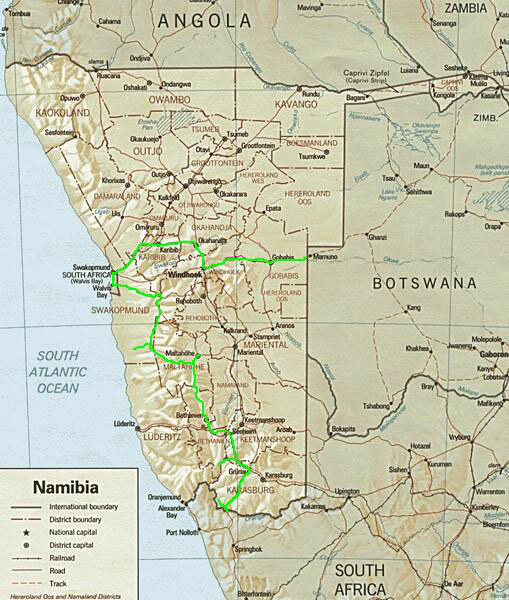 Do you like Cycling Namibia? I crossed the border right in the middle of vast Kalahari Desert and followed the Trans-Kalahari Highway for two and a half hot days before reaching Namibia´s capital Windhoek. Though German was just the country´s third language, beside English and Afrikaans, Namibia appeared to be German rather than anything else, at least regarding the numbers of German tourists. Almost all of the sightseeing signs were written in this strange language with the ü´s, ä´s and ö´s. I strolled around town for one day together with Eva from Germany, passing the "Christuskirche", the "Alte Feste" and the "Tintenpalast". Because of the raining season, which was already about to start, I changed my mind and decided to skip the trip to Etosha National Park. With a couple of other guys I went for sandboarding in the dunes two days later. Contrary to the selfmade boards in Peru here I got a real and proper snowboard with boots which allowed serious boarding. Sandy madness, I could have done it for days! Next day I left and cycled 30 km to nearby Walvis Bay, explored the huge lagoon with flamingoes and pelicans and splurged in the supermarket, as the latter, as well as tarmac and real civilisation, would become rare for the following couple of weeks. For the next days there wouldn´t be water either and so I left the coast, heavily loaded with water, inland into the Namib Desert, climbing slowly but continuously uphill to 1,000 m above sea level. This first day I was pretty much ok with the tremendous heat which was hardly bearable due to the total lack of even the slightest shade. But on the second day, when the unpaved road went up and down, it got terribly hot again and I was sliding with my bike in deep gravel, which in fact slowed me down even more. In the afternoon I had to surrender. Although I got water left, I was totally exhausted. Every single hundred metres appeared to be seemingly impossible to manage and I reckoned to get virtually knocked out in the next couple of minutes. And this would have been definitely more than fatal right there and right at this time of the day! I was lucky as there were, rather unusual in this treeless desert, less than 200 m away three leaveless trees, of which one had a trunk right big enough to provide a small shade on the hot desert ground. I spent ages lying on the ground in the shade of this tree, leaning against the trunk, hardly able to keep my eyes opened. And I couldn´t shut them as I was afraid of falling asleep. I drank a tiny little bit of the remaining water, but I felt sick afterwards. Only more than two hours later I got clear again and decided to camp right there though it had been just 20 km left to go to Solitaire petrol station. By all means I was needing serious food, but there wasn´t enough water for cooking. Just four cars passed by this day. Luckily I stopped one of them and got two litres of water, which was more than enough. Despite all the deserts I had successfully crossed on my bicycle travelling trips, this had been the very first time that I necessarily had to ask someone for water. But, even better: A brainless bodybuilder from South Africa, obviously drunk, attacked me without any reason and after I threw sand in his face he pushed me to the ground. The owner Moose apparently was interested in the reputation of his petrol station and campground rather than in his guest´s well-being. As the brain-dead idiot had honestly apologized and even had offered (unsuccessfully of course) money and as I was by no means keen on meeting him again somewhere in the desert, I didn´t give in by listening to selfish Moose and reporting him to the police. Apparently this happened from time to time in Solitaire. Well, at least together with the previous afternoon this day had prime chances to get part of the top 10 of the most awful days of this trip. Next day I was all by myself in the desert again and with the gorgeous landscape around me I easily forgot what had happened the day before. I cycled to Sesriem, starting point to Namibia´s supposedly biggest tourist attraction: the red Sossusvlei Sand Dunes. Before heading there I descended into nearby Sesriem Canyon, where I made it into Korean television as a Korean film team spontaneously made an interview with me. Markus and Vivienne from Germany gave me a lift with their car the next day before sunrise for the 65 km from the campsite to the red dunes. But the usually ever clear blue sky unfortunately was that overcasted, that we couldn´t even realise the sunrise. And as the dunes and the dry vleis were little spectacular without sunlight we went back after a couple of hours. So I gave it one more try the following morning, when Rainer and Susi, Germans as well, gave me a ride. And eventually I was lucky: Together with the two of them and later by myself I spent hours wandering in the red sand in this breathtaking and somehow unreal scenery, one of the world´s oldest and driest eco-systems. When the heat, particularly the sand´s heat, became virtually unbearable, Alex, unsurprisingly from Germany as well, luckily gave me a lift back to the camping site. Three more days of desert cycling on rough gravel roads further south brought me to Bethanie, where I, in view of a spectacular breakfast at the local hotel camping site, spontaneously decided to have a day of rest. Another 200 gravel road kilometres further south I met Andre and Emile from Cape Town, South Africa, with who I shared a campsite and who gave me a lift with their car to nearby Fish River Canyon, the world´s secondbiggest canyon. Because of the tremendous heat at the canyon´s bottom the descent was prohibited at this time of the year. Therefore we decided just to drive around to a couple of stunning viewpoints which provided impressive and spectacular views. After a decent night at the roadhouse bar where we camped, next morning I said goodbye to the guys and got started. 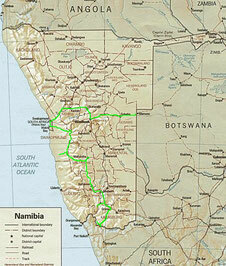 For two days I cycled further south to Orange River which marked the border to South Africa. I took a day off at a river camp and swam into South African waters. Next day I crossed the border legally by bicycle and left this breathtaking world of sand, which had been my home for almost the last four weeks. For the 42nd time on this trip I entered a country.